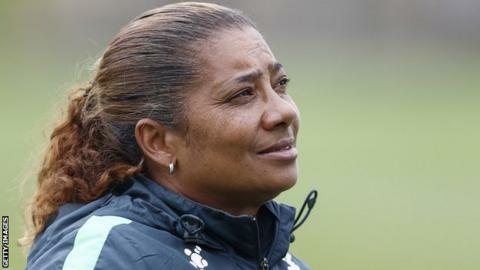 Desiree Ellis, coach of South Africa's women's team, insists there are positives to be taken from Sunday's 1-1 friendly draw with Jamaica. The hosts missed a penalty in Durban in their second last warm-up game before a maiden World Cup finals appearance. The stalemate took Banyana Banyana's winless streak to eight matches ahead of June's World Cup in France. "Winning the game gives you confidence and momentum, but we didn't lack effort," said Ellis. "We wanted to go for the win and created opportunities. Winning gives you that little more confidence, it would have been fantastic to do that. "We look at the bigger picture and that is the World Cup. "We are happy with the effort, but there is still a concern that we are not scoring enough goals with the chances that we create." South Africa lead in the 26th minute through Linda Motlhalo, in front of a fairly large crowd in Durban, but then gave up an equaliser to Khadija Shaw. Banyana Banyana should have restored their advantage when they were awarded a penalty for handball in the box, but Leandra Smeda crashed her shot against the crossbar and had a later effort ruled offside. "We have asked the players to go home and work on their finishing, the onus is on the players to work on that. We needed a little bit more composure in the box," added the coach. "I thought the first half we dealt well with everything, we are always very organised at the back and the players must take credit for that because they put in the hard work. "We do need to minimise our mistakes, but I thought everybody put in a magnificent effort, we really worked for each other." Ellis made a full raft of substitutions during the match and was pleased with the contribution of many of the fringe players coming off the bench. "A lot of players raised their hands again, we made a lot of changes and the players that came on changed the game in a positive way. That helps us with our thinking." Now Banyana turn their attention to a prestige friendly in Santa Clara against three-time World Cup winners USA on 12 May. "It is going to be a tough challenge, it will give us an indication of where we are at," added captain Janine van Wyk. "As players are excited to travel there. Going to play against a quality team and quality players, gives us that mind-set that we have nothing to lose and we can learn as much as we can." At the World Cup, South Africa are in a group with China, Germany and Spain, who they meet in their first match in Le Havre on June 8.